The Knitting Pirate » In Which the Pirate Sets Goals. « In Which the Pirate Has Warm Arms. In Which the Pirate Sets Goals. Currently on the needles, I have the neglected Stripey Striped Socks, the not-yet-forgotten Napramach, my current traveling sock (I've just realized I've never taken a picture of it, nor of the last pair of socks I finished! Must rectify that.) and the light and airy Dancing Cranes stole. The stole doesn't need to be finished until the middle of October, but I know it will take a while, so I want to keep up with adding at least a row every day, and preferably two. With around 60 or 90 rows left to work, depending on whether I choose to do three or four pattern repeats, I don't want to risk the chance of not finishing it in time. I do like working on it, but it's a solitary sort of project, and I don't always want to lock myself away to work on it. The sock will just travel around with me until it's finished - I've almost completed the first of the pair, and then the second will take up residence in my purse. When I'm done with that one, the second Stripey Striped Sock can become my traveling companion if I haven't yet finished it at home. It's not the best sock for the job, but it'll have to do, because I really want it to be done. Napramach... I actually don't know how long it will take for me to finish this thing! 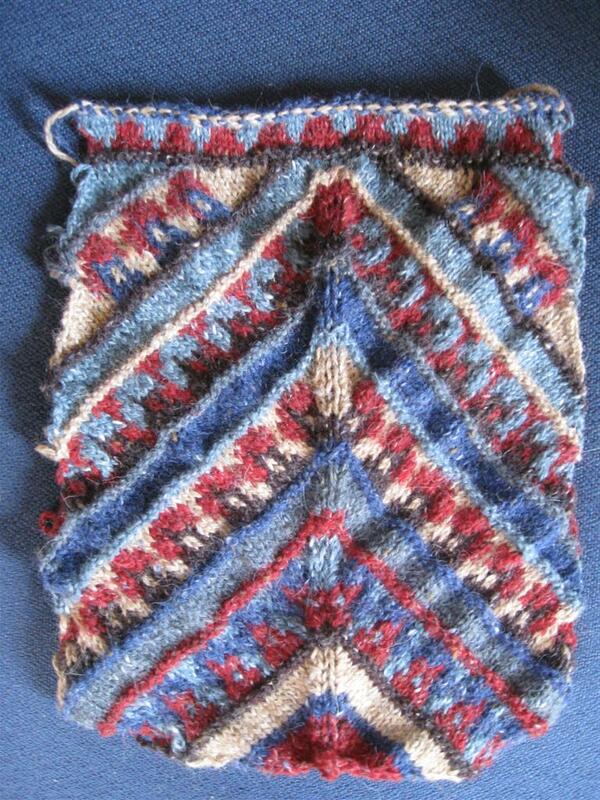 It took me six weeks to make the first half of it, and I seem to be knitting much faster now. Maybe three weeks? Then blocking, crocheting the sides together, and sewing in the lining, and it's done. I'm guessing that my friend has probably forgotten about the bag by now, or if she hasn't forgotten then she's given up hope that I'll ever finish it for her. It will be a nice surprise for her when it's finished - she only knew that I was making a bag for her, but I never told her what it would look like! The bonus prize of finishing Napramach will be that I'll have most of each of six colourways of Rowan Felted Tweed to play with after the bag is done. I'm thinking of designing a colourwork hat with the leftovers; there should be more than enough, and I already know how nicely the colours go with one another. The second bonus prize will be on my yearly tally, because I'll be able to cross off six balls of yarn from my count! I wonder if I should cross off all six balls, because I bought them specifically for this project? Or do I mark each of them as half-used, since there will be enough to make another project? The Stripey Striped Socks are close to the heel on the second sock, and I can't seem to find my notes on how many heel stitches I left unworked in the centre of the short-row heel. I think I scribbled them on a tiny piece of paper, not expecting nearly two years to fly by between sock heels. I'll count stitches on the first sock and try to get the second sock as close as I can. I'm going to love each of these projects when they're done. And I hate having the Stripey Striped Socks and Napramach hanging over my head. I see them and think I ought to put some rows on them, and then I go do something else. It's time to crack down and get these projects done and off the WIPs list so that I can start new things. 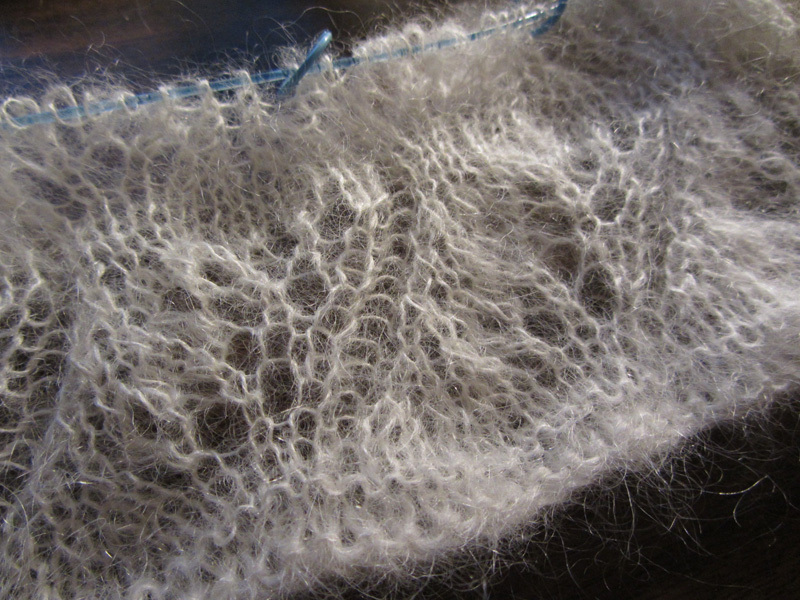 At the same time, I don't want to burn out on knitting again; I know that's more likely to happen when I'm forcing myself to work on projects that I don't like as much. I'm just going to work steadily on these four projects until they're done, and I won't start anything new until at least both pairs of socks are finished. Then, of course, I'll need a new traveling sock. 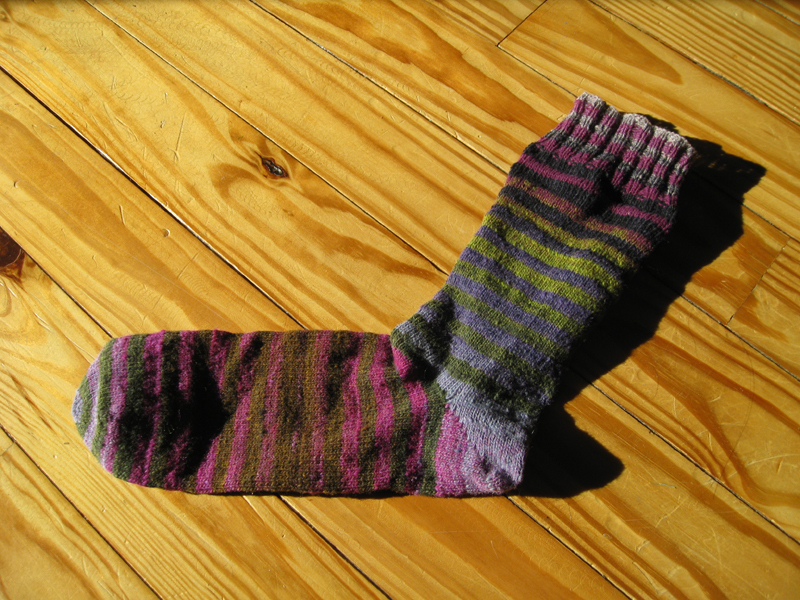 This entry was posted on Thursday, February 16th, 2012 at 10:00 and is filed under bags, dancing cranes, lace, napramach, sock, stripey striped sock, wendy's toe-up gusset sock. You can follow any responses to this entry through the RSS 2.0 feed. Both comments and pings are currently closed.